Well, I'm sure you've seen the promotions for this one. Finally, after years of dragging their feet and avoiding the answers, the Marvel crew is ready to come to terms with what actually happened on Peter and Mary Jane's wedding day. Well… perhaps the word "actually" isn't entirely appropriate in this instance. 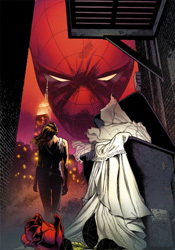 We know what "actually" happened the first time around, but ever since One More Day rewrote the character's history, it's become obvious that the couple's big day was the specific moment when Spider-Man's original timeline and the one he currently occupies made their big split. If we've learned anything from this lingering fart of a storyline, it's that no historical event is too big to be tampered with, so perhaps using a word with such finality isn't entirely appropriate. After all, who knows how long it'll be before these new revelations are being tweaked and reworked themselves. Written by the EIC himself, Joe Quesada – who also provides a few pages of artwork – One Moment in Time aims to answer all the questions Spidey fans were supposed to ask themselves after that poorly received storyline hit shelves almost three years ago. That's a problem, not just because most of the audience has been anxious to leave the controversial tale behind them, but also because Quesada himself is anything but a quality writer. Beyond my obvious reservations about any story that tinkers around with the past, the timing, pace and general structure of this issue hit me like a succession of flat notes. The book's focus leaps unannounced from present to past to revisionist history and back again, slipping pages from 1987's Amazing Spider-Man Annual #21 in between awkward breaks in the Peter and MJ's strangely emotionless conversation in the present. In the midst of those flashbacks, certain pages of the original story are omitted and a series of new panels exploring a lame side storyline are crammed in. The idea was to match the look and feel of the originals, both in terms of look and storytelling, but it fails in both respects. Jim Shooter and David Michelinie's original pages, despite their age, feature both a more personable set of characters and a more poignant, introspective narration. The new variations Quesada and company try to slide in are ham-fisted imposters; rather than enhancing the new revelations with a sense of authenticity, the inclusion of these old panels only serves to spotlight how far from the book's core the new direction is carrying us. The issue's artwork is all over the place, from Paolo Rivera's unsuccessful Paul Ryan impression to Quesada's thick, over-dynamic compositions. Rivera's work is probably the best of the lot, making the most of a tough assignment with a limited but effective approach. His actual pencils aren't far off from the dated style he's asked to mimic, but the work is betrayed by an extremely muted, flavorless coloring effort that leads it to stick out where it's meant to be fading in. Paul Ryan's efforts, a product of a time when colors were blunt and artwork more literal, stands the test of time fairly well. His style may not be the modern flavor, but it's clear even in retrospect that he was trying out new ideas in storytelling and composition at the time of the story's original publication. Quesada's artwork, usually the centerpiece of his involvement in a series, is totally out of place here, a true rotten egg. Inactivity has spoiled his consistency and too much willingness to push the visual envelope results in artwork that constantly thinks it should be doing more than is ever really necessary. From cover to cover, the first chapter of One Moment in Time is a great disappointment, soiling a strong story from the publisher's vaults in the hunt for another big event. It's very much the spiritual successor to One More Day, and I don't mean that as any kind of a positive. The issue is ill-conceived, confusing and convoluted, the ramifications are painful and plentiful, and the message is clear and simple: Marvel isn't above sullying their own history for the sake of a few extra sales. It's an awful story that sets a terrible precedent for the future direction of this series. Skip it. Spider-man's story has been so messed up I can't enjoy reading it supposeI can always go back and read the old issues, but as far as I'm concerned Spider-man is FUBAR at this point.